The interior itself is pretty small. It includes the main kitchen area, a small order counter and bar seats at the side. With lunchtime in the CBD often being a chaotic affair, the good folks at DOCO keep it simple. 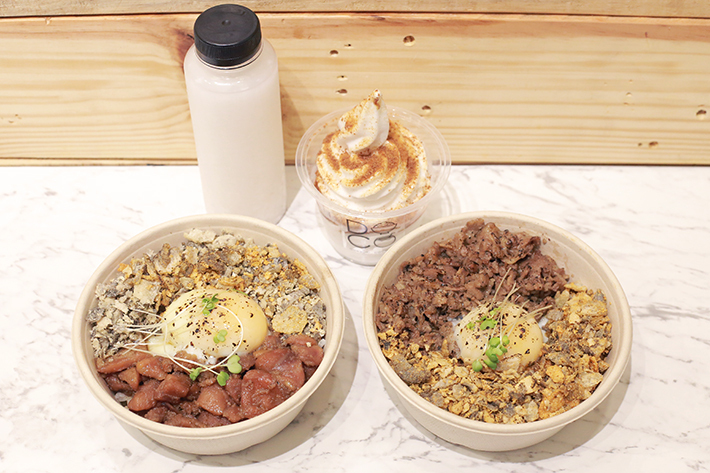 Simply, choose one of the two available donburi options, decide if you would like any add-ons and lastly, choose between either the coconut shake or the coconut soft serve. The Sh-nack Don (S$8.90—essentially a beef rice bowl—came with a generous portion of peppery beef, an onsen egg and a copious sprinkling of crispy cajun-spiced fish skin. The grilled beef was jam-packed with flavour with a subtle sweetness that went excellently well with the Japanese rice. The onsen egg provided an added richness but the real money-maker was the cajun-spiced fish skin. Crumbled nicely over the rice, it gave the modest rich bowl a wonderful smoky aroma as well as a much-needed hit of umami. The other alternative donburi option is the Sh-ken Don (S$8.90) which comprises honey miso chicken instead of beef. It, too, comes with an onsen egg as well as a generous ‘sh-prinkling’ of that glorious cajun-spiced fish skin. Compared to the beef option, the chicken was tasty but a tad too dry for our liking. Be sure to pair it with the Coconut Shake, which is made purely from fresh blended Thai coconut water and coconut flesh. A refreshing treat to have is their decadent Coconut Soft Serve (S$4.90) that comes as part of your main meal. This dairy and nut-free dessert is drizzled with gula melaka sauce and powdered gula melaka for that extra sweetness and oomph. The subtle roasted flavours of the gula melaka really elevate the rich and creamy coconut flavour making it pretty similar tasting to chendol (minus the little green slug-like jellies). Overall, the soft serve is refreshing and light, and we would recommend trying it whether or not you decide to have your lunch there.